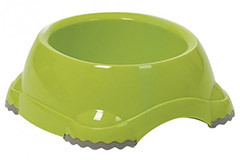 Choosing a feeding or drinking bowl for your pet cat or dog is not always an easy task as there is so much choice available, so this article offers a guide to the different types of pet bowl or dish you can buy, and the differences between them. You can find pet bowls and dishes in a variety of materials, styles, sizes, weights and colours – there is almost certainly a bowl out there to suit every pet and owner! Different types of bowls offer different features, and each have their advantages and disadvantages. This article will run through each type of pet bowl to hopefully make it easier for you to choose. 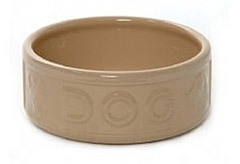 Plastic pet bowls are available in a variety of different sizes and colours, and are usually relatively cheap to buy. The main advantages of plastic bowls are that they are lightweight, unlikely to break if dropped and available in a range of bright colours. 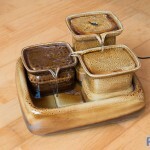 They are also usually dishwasher safe too, making them easy and convenient to clean. 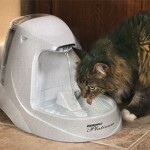 The disadvantages to them are that the lightweight means it is easier for your pet to knock the bowl around causing spillages, and bowls made from softer plastic are more easily chewed or scratched, leaving places for bacteria to build up. Also, some pets may develop an allergy to the plastic causing a mild skin reaction on the chin or face. 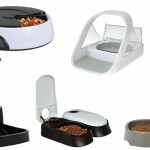 Stainless steel pet bowls are very tough, durable, and hygienic too. They are usually dishwasher safe, although look out for exceptions like some of the designer Wetnoz bowls. Designs can range from the basic plain steel bowl, to luxury designer bowls that suit the most stylish of homes. You can even combine the toughness and of stainless steel with the colourful designs available with plastic by going for something like this Catit 2-in-1 bowl or Double Diner bowl. Look out for bowls with rubber non-slip bases to prevent the bowl from sliding around when used, as this will reduce spillages and stop your dog or cat chasing their bowl across the floor! Ceramic pet bowls are a great choice if you want to combine style with function. Ceramic pet bowls are heavier than metal or plastic bowls, so your dog or cat can’t knock or push them around so easily, and they also keep food and water cooler for longer on hot days. The protective glaze means they are very easy to keep clean, especially if the bowl is dishwasher safe, so they are hygienic too. They are available in a range of designs and colours – including the well-loved Mason Cash range of plain ceramic bowls. The only real downside is that ceramic bowls are susceptible to damage if dropped or knocked hard, so should be regularly checked for chips or cracks. Cats generally do not like to bend their whiskers while eating or drinking, so buy a cat bowl that is large enough, or look for a bowl that is shaped to ensure their whiskers don’t touch the sides. Ensure the bowl is an appropriate size – an average healthy dog should drink about 15-30 ml (1/2 to 1 oz) of water per lb (around 30-60 ml per kg) of body weight per day, so a 40lb (18kg) dog needs about 1 litre of water per day. This entry was updated in Cat, Dog, Products on December 6, 2018 by Ed.